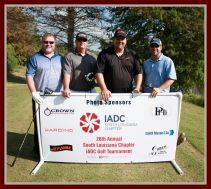 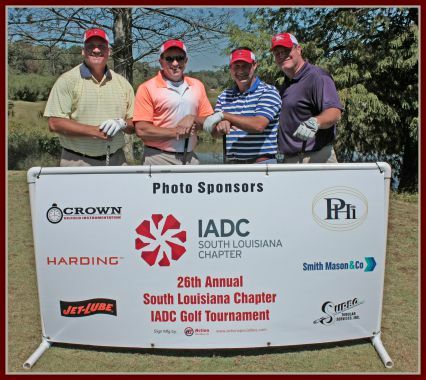 The South Louisiana Chapter of the IADC and the IADC Golf Committee would like to thank all of our tournament sponsors and participants for another outstanding turn out for the 2013 IADC Golf Tournament which was held at Squirrel Run, Oct. 3rd & 4th. 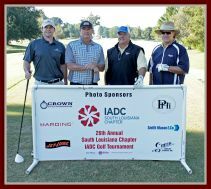 Due to the dedication and support from our long time sponsors as well as the many new sponsors this year we were able to fund 43 - $1120 scholarships as well as provide funding for our local charities. 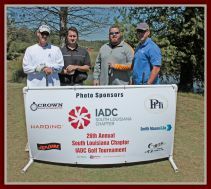 Enjoy the many pictures of the 2013 tournament on our website and don’t forget to download your entry and sponsorship forms for our 2014 Tournament scheduled for Oct. 2nd & 3rd to be held at Squirrel Run. 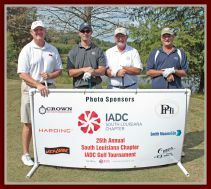 If you have any questions about last year’s tournament or this year’s tournament you can contact me, Greg Daigle at: gdaigle@dai-emg.com or telephone: Off: 337-266-5881 or Cell: 337-230-7386.